Greg was gone for 9 days and just got home on Saturday. I am so glad he's home and so are the kids. We managed pretty well while he was gone thanks to friends and my parents. I am pretty proud of the fact that I pulled off this surprise master bedroom makeover but even more proud of the fact that the kids only watched one Veggie Tales video the whole time Greg was gone while they were at home! yay! If you know me, you know that's a pretty big accomplishment! Anyway, back to the makeover. In most homes the master bedroom is the last room to be updated/redone when moving in. Other things take priority...removing wallpaper, painting main living areas, decorating and organizing kids rooms, etc and so the master bedroom usually takes a back seat. Such is the case in our house as well. Now, the paint colors when we moved into this house were pretty good and we didn't find it necessary to paint right away and there is only a little wallpaper in this house as "top of the room" borders in the kitchen and dinning room (the kitchen is next). 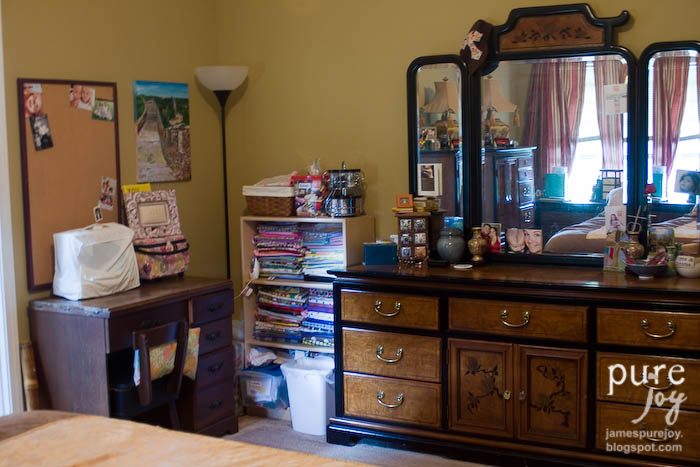 The kids rooms are pretty well decorated and organized but the big girls room hasn't been re-done since we moved Naomi in there (that's on my list of things to do while they go to grandma and grandpa's house in a week). I did surprise Greg with a laundry room paint job when he went away in January (I can't believe how much paint costs...just seems a little crazy!). 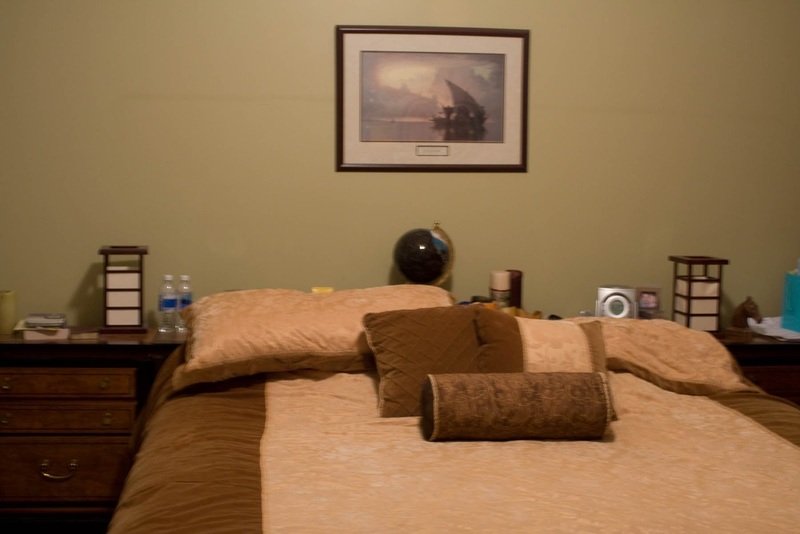 But the master bedroom has always bothered me. I'm sure the paint color was great for the previous owner but pea green just isn't my color and it didn't match our furniture at all. We've moved things around in a our room a couple of times but never really got the room fully situated. So, I was glad to have this opportunity for a high impact, low dollar makeover! 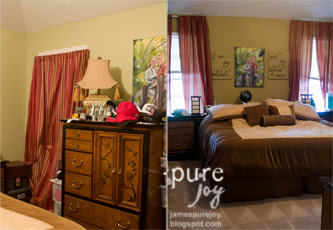 Technically, I only spent $10 on this bedroom makeover...and I'll explain how in a minute. 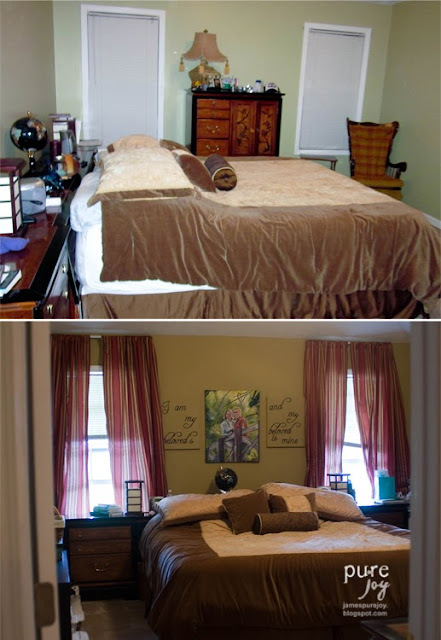 Yes, money was obviously spent along the way to get lamps, the comforter, curtains etc but for this makeover at this time I only spent $20 (the bedroom furniture was a graduation gift to Greg when he finished his undergrad work). But this room only cost me $10 because I only used one gallon of paint. I don't have companies paying me money to use their product and blog about it and we're on a tight budget so this will work for now. 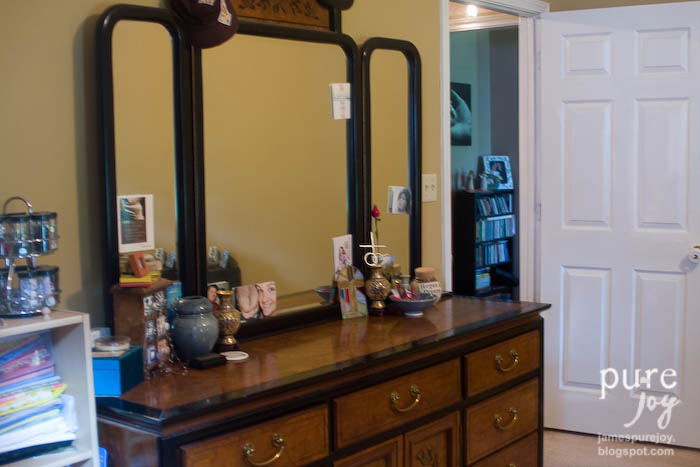 I was telling my friend that I was thinking of doing this makeover while Greg was gone and she told me that she had some leftover paint from her recent "new house, room painting". She was generous and kind enough to give me two gallons for the price of one, $20. So, since I only used one gallon this room technically only cost me $10. Pretty good, hey? Now, is this room EXACTLY like I hoped it to be? No. Is this room straight out of a magazine? Not a chance. Is this room comfortable and beautiful enough? Yes. 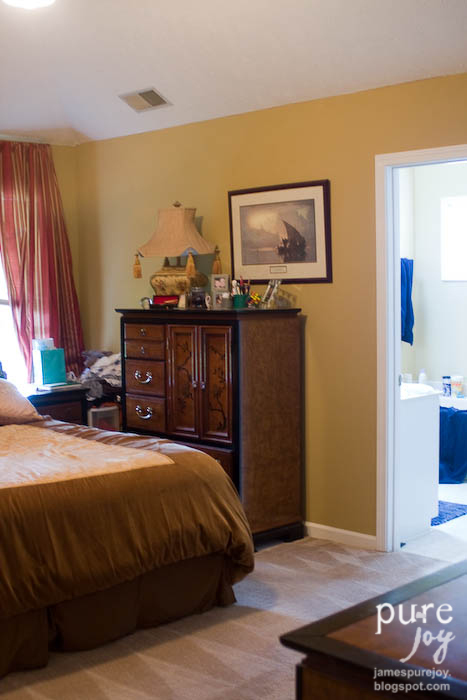 Was this room thrifty? Yes! So, for now...I'll take it. 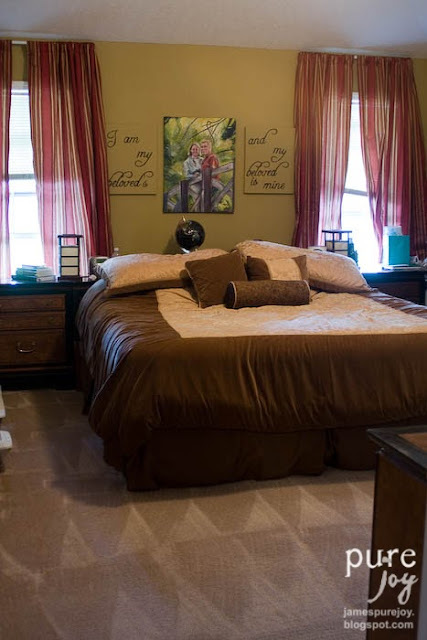 Some day year when we can set aside some more money for our master bedroom then we can get all our dreams and hopes for this space accomplished! So, here in photos are some before and after shots! We put the bed on the long wall to begin with because that's where the previous owner had their bed (although they had a queen and we have a king). We really just moved our stuff in once and called it good. 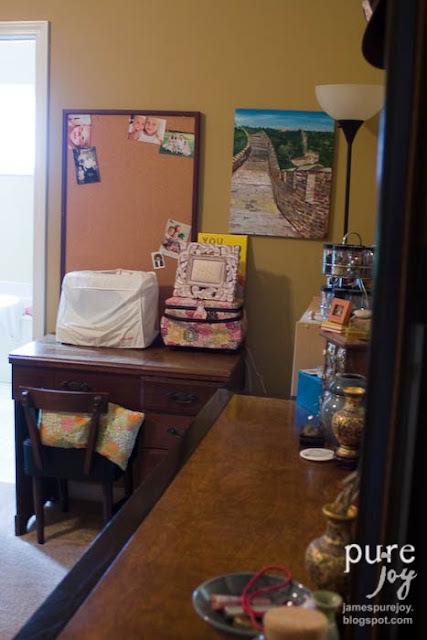 When we found out we were having another girl (not a boy to share a room with Micah) I knew I had to say goodbye to my craft room so I had to add my crafting stuff into the master bedroom. My crafting items and books sorta took over the whole room. I know I've said it before but I'll say it again, Greg is so gracious with me and my crafting "crap" and only gives me a hard time once in a while! Sorry for many of the less than stellar photos...I was in a hurry! 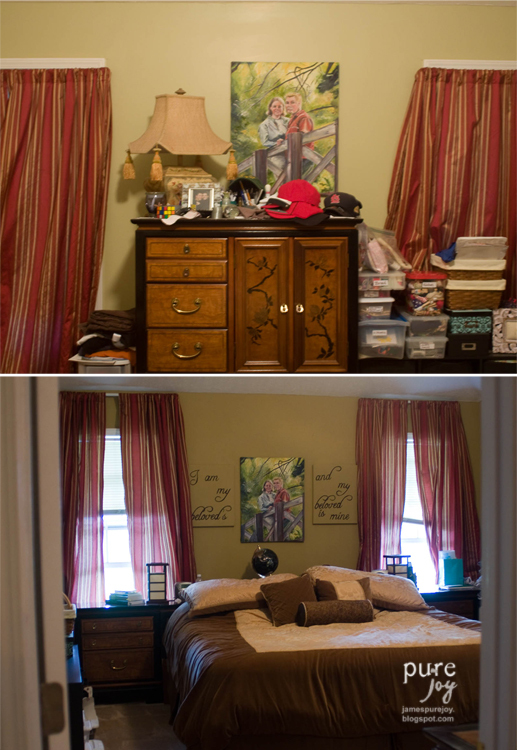 The left is a before shot and the right is the room in it's current state. So this is what the room looked like 3 days after we moved in. The photo below is the "now" photo. This is what the room looked like last week before I started to empty the room and paint. With the after photo below it. What a difference a gallon of paint and a shift of furniture can make! The bed was on the long "pea green" wall and we just hung the photo on a nail that was already in the wall from the previous owner...come on, I know you've all done that too. We just wanted SOMETHING on the wall. I had plans for hanging other photos but now I'm glad that I just waited! So after the paint went up on the walls I immediately moved the curtain rods UP. I mean really, who hangs their curtains BELOW the molding of the window! Again, another thing we KNEW needed to be fixed but something we just didn't take the time to do. It's amazing how moving the curtains instantly made the room feel different and bigger...plus the location of the bed now makes the room SO. MUCH. MORE. SPACIOUS because we can actually walk to the bathroom and out the door without having to walk around the bed. The bed used to come about the same distance away from that wall but it blocked half of the bathroom door. Now, with the bed on the wall with the windows the bathroom door is not blocked at all!! And I LOVE my vaulted ceilings...makes the room feel so much bigger! 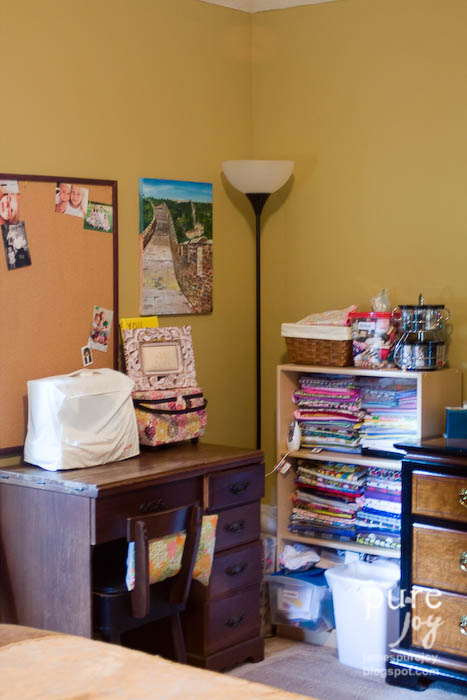 My new little crafting corner is MUCH more organized and not blocking Greg's part of the room. I always felt guilty for having him have to walk around my crap so much. Now that things are organized and I know where everything is I can put things back much easier and hopefully keep it a little more clean and organized than it was before. Hopefully! I will do my best!! The painting in the middle is one that my best friend did for Greg and I as our wedding gift. It was her first oil painting and one of our engagement photos. I LOVE this painting and it is very special to me so I wanted to give it a place of honor. It's so fun to see where we've come from. The kids always say "is that really daddy? he doesn't have blonde hair." Well kids, he did. I knew I wanted to add something to the sides of the painting because it didn't really "fill up the space" but I didn't want to take away from the painting. 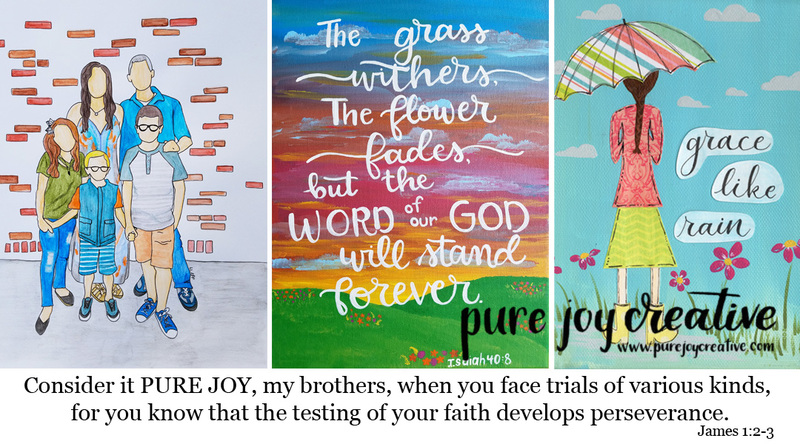 So after some pinterest searching an idea hit me. This painting was my inspiration. 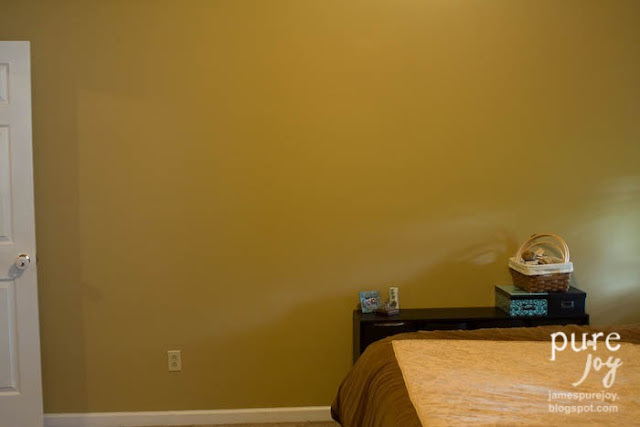 I painted over two paintings that were "in progress" but that I didn't really love with the wall color and that is why there was no cost involved there. I realize how off kiltered my words are and if I had time repaint over both canvases and start again I would. It really does bother me...but for now I need to leave it alone. 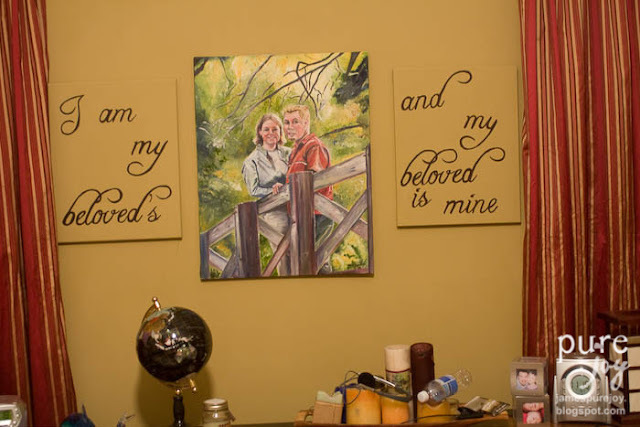 I wanted the canvases to be the wall color because I didn't want to distract too much from the main painting and I almost wanted it to look like the words were right on the wall. For now, it works. I will fix it someday...soon. Love my little sewing corner! I sorted all my fabrics by yardage thanks to a tip from my cousin who sews professionally. Now I know how much I have in a certain fabric so I know if I have enough for a certain project! Don't let the shelf fool you though I have another plastic tub or two in my closet with scraps and with snuggle fabrics, fleece and felt. This is the wall that the bed used to be on (although the lighting in this photo is wonky and it almost looks green) I have BIG plans for this wall...well, two ideas really and I'm still debating which idea to do...so, plan on seeing a blog post in the future about this wall...just don't hold your breath it's not going to happen very soon. I finished the room makeover just 30 minutes before Greg got home...just enough time to take a shower and look like I wasn't doing anything when he came in. He was surprised and loves the layout of the room. He doesn't even mind that his dresser is a little closer to the bed than it used to be because of all the room we gained at the foot of the bed!! 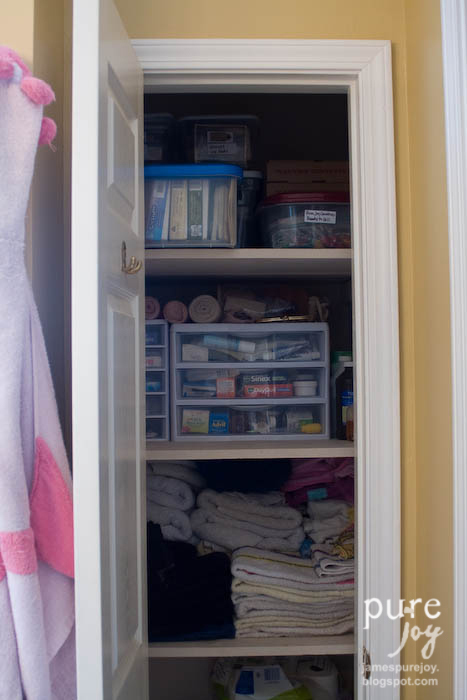 I also took some time to clean out, declutter, and organize our little bathroom closet!! It's so much more more usable now! Someday I may tackle the clothes closet as well!! 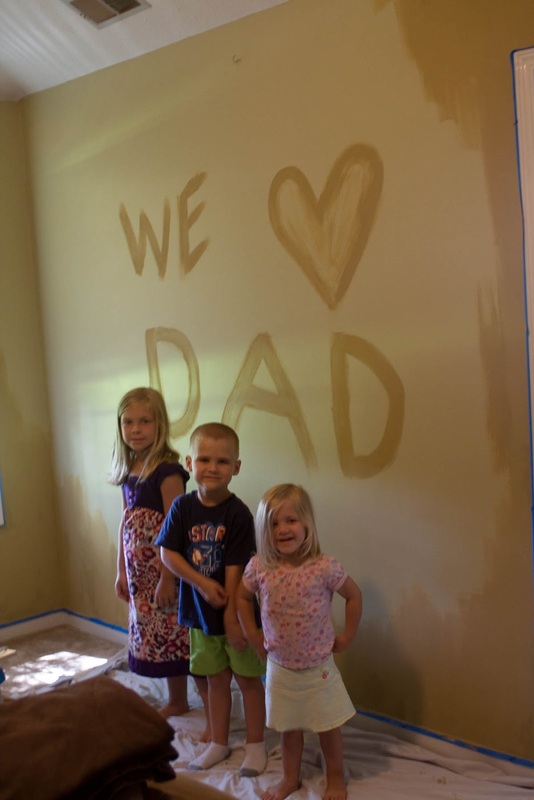 I also need to thank my parents for helping watch the kids and helping me paint! Couldn't have done it without you!! So, what do you think? Not bad for ten bucks hey!? !